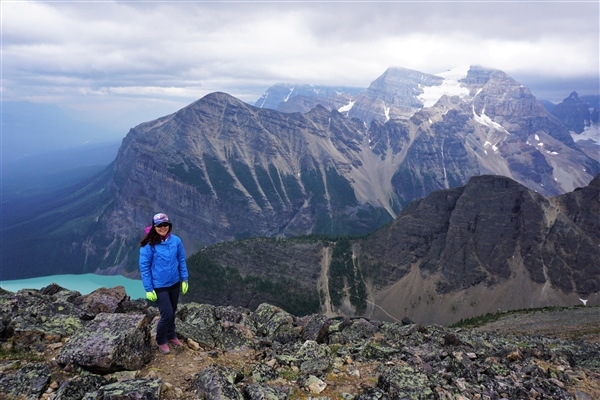 KEEN’s Terradoras are the perfect hybrid hiking boots to take you from city parks to mountain trails. 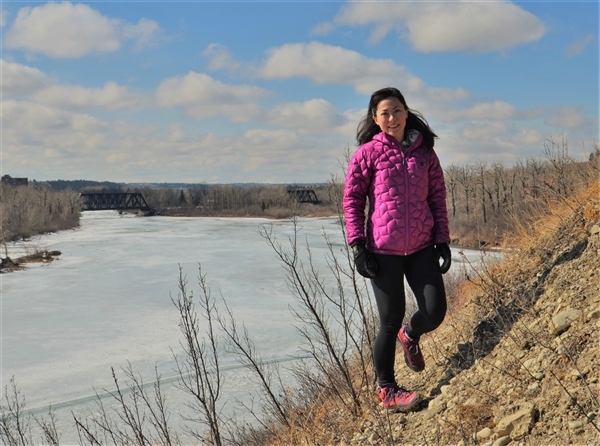 Designed specifically for women, these lightweight hikers are narrower in the heel and toe and have a lower collar to line up better with women’s achilles. Not only do they fit like a dream, they are also waterproof and pretty good looking! 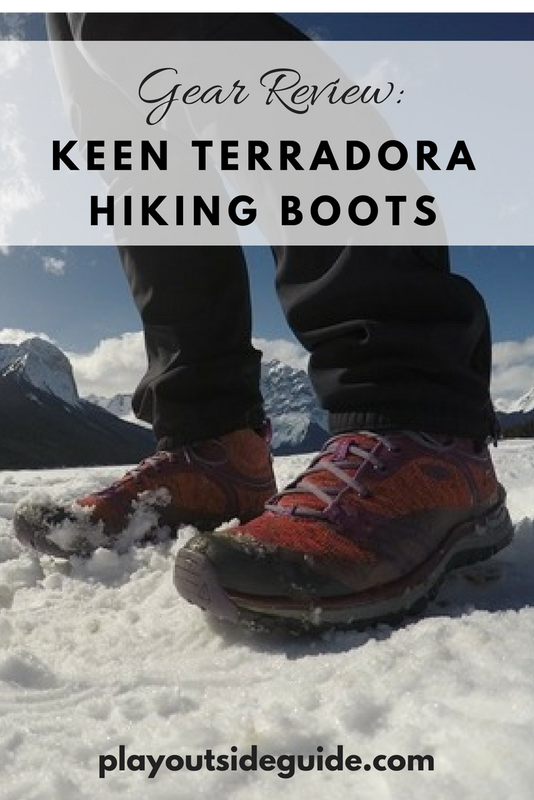 Here’s my experience with the KEEN Terradora Mid WP hiking boots over the past year. Disclosure: KEEN Canada generously sent me a free pair of Terradora hiking boots to test and review. All words and opinions are my own. Boot lace hooks above the ankles keep laces secure and enable you to get the perfect fit. I can lace the bottom of my boots moderately snug and lace the tops tighter to prevent heel lift (and keep debris out). Since I always get black or brown hiking boots, it was fun to get colorful ones for a change. I’ve gotten lots of compliments on them and love that they match my jacket! Prefer neutral shades? The Terradoras come in 10 other colors. I put the Terradoras to the test in a wide range of conditions (rain, snow, slush, ice, mud, streams) on all sorts of terrain (dirt trails, gravel trails, pavement, and scree). While I mostly hiked in the Terradoras, I also did some trail running and scrambling in them, and found them to be quite versatile and comfortable due to the narrower toe, lower collar height, and cushioned heel. My Terradora boots were my footwear of choice when I coached adventure running last spring. They kept my feet dry in wet/slushy conditions and gave me some extra traction (vs. running shoes). Women’s Specific Fit: KEEN really nailed it with the women’s-specific last on the Terradoras. The width is just right for my slightly wide feet! Lightweight: The Terradoras are made of a lightweight, breathable mesh. Women’s size 7 is only 12.8 oz / 363 g! Waterproofing: The KEEN.DRY waterproof breathable membrane keeps my feet perfectly dry even when crossing shallow streams (or standing in them to photograph waterfalls)! Support: The Terradoras may look like shoes, but they have the support you would expect from a light hiking boot. They have patented toe protection; full length ESS stability shank in the sole to increase stability, prevent twisting, and reduce foot fatigue; and dual density PU footbed that molds to your foot and provides great impact protection. They are stiffer than running shoes, but have more flex than my KEEN Durands, so they are perfect for dayhikes when you want to travel light and fast. 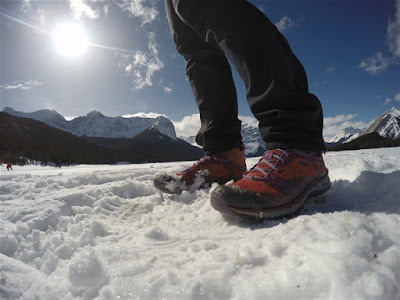 Traction: The 4 mm multi-directional lugs provided excellent traction on dirt trails and slab, as well as moderate traction on scree, but I found my feet slipping a bit in deep mud and slushy snow. No Break-In Period: The Terradoras are comfortable right out of the box as they have synthetic/mesh uppers. The Terradora boots are great waterproof boots for light hiking, but for scrambling I would like to see a heavier-duty, leather version of the Terradoras for increased durability. Update: There is now a leather version of the Women’s Terradora Waterproof Mid Boots! The KEEN Terradora Mid WP Hiking Boots are my new favorite light hikers. They fit perfectly thanks to the women’s specific last, and are light, nimble, and waterproof. Their fun look is a bonus too! Purchase KEEN Terradora boots on Amazon here (affiliate link). 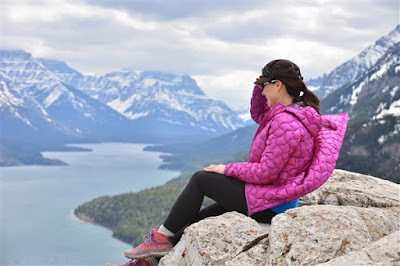 Purchase the women's KEEN Terradora Mid WP Hiking Boots from KEEN Canada, Amazon (affiliate link), or select retailers.